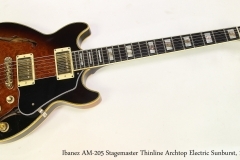 The Ibanez AM-205 Stagemaster looks like it could be inspired by the Gibson ES-339, with its smaller body and ES thinline construction, but it predates the Gibson model by about fifteen years. While its first catalog appearance was in 1983, this AM-205 Stagemaster carries a serial number indicating September 1982 production. Ibanez guitars met and exceeded the quality of North American and European guitars by the late 1970’s. These are top grade instruments and have appeared on many stages and recordings. Drawing on the general design of their successful solidbody Artist models, the original Ibanez AM and AS series were produced in Japan likely by Fuji-Gen Gakki. 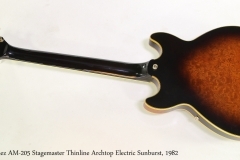 These guitars are thinline archtop electrics, using the solid center block pioneered by the ES-335 in the late 1950s. The AM-205 uses a burled mahogany laminate for the body, and a mahogany neck with a bound ebony fingerboard. The inlay is not over the top, but is limited to a stylized fleur headstock inlay and mixed Mother of Pearl and Abalone block position markers. Hardware is gold plated, and includes the massive Gibraltar adjustable bridge and Quick Change II tailpiece. The original wiring scheme uses a pair of Super ’58 pickups wired to individual volume and tone controls, and a pickup selector. On this guitar, the original pickups have been replaced with a popular Seymour Duncan set – a JB in the bridge position and Jazz in the neck. The original pickups are in the case, which is also original. The strap buttons are a conventional design, and are replacements. Ibanez has used a ‘V’ shaped strap pin named the ‘Dead End Strap Post’ for quite some time. The finish is a durable gloss tobacco sunburst in poly. This guitar is in good playing condition but has some touchups on either side of the bridge volume control. Aside from the pickups, the wiring is original. On these models, the volume and tone parts are wrapped in foil for noise reduction. An interesting aspect of Ibanez guitars of this period, and the care with which they were built, is the signature on the label. I can’t make it out; another example seems to have been signed ‘Ichikawa’.